Forty-five years ago today, a Vietnamese monk, Nun Nu Thanh Nuang, poured gasoline and set fire to himself in Hue. Twelve years ago today, Timothy Leary died in his sleep. After all these years, I honestly don’t know whether Dr Leary’s work helped us understand why the monk’s death was importance to us, or whether he helped mask us from the true meaning by taking us elsewhere. Many saw no conflict in actively protesting and actively tripping. In fact, many claimed then that the “enlightenment” received through herbal and chemical stimulation was an important component of our political activism. These days, I wonder more often whether we were just bullshitting ourselves and simply following the pleasure principle. Deciding to check out Me & Julio’s Honourable Mention in this year’s Vancouver restaurant awards, we had dinner there last night. Overall, it it was pretty good. Me & Julio advertizes itself as the “modern Mexican kitchen” and it lives up to that. The dishes use traditional ingredients and forms (taco, enchiladas, etc) but combine them in new ways and plate them flawlessly with modern style. The menu isn’t long, allowing the kitchen to focus on a few good ideas. My better half chose the paella, which had also tempted me. Unfortunately, it was bland and uninteresting. It seemed to cry out for salt, but at the same time one knew that would simply change it, not improve it. I had much better luck with the bistec. It was rare as ordered and came with a fine if unoriginal prune sauce. Side vegetables were excellent and the horseradish-avocado mash was very good indeed. They have a huge serving staff and service was polite and competent. However, they don’t seem to have the same staffing levels in the kitchen and the wait for food was too long. On a more positive note, they have used the space available really well, with a single large room. Decoration is muted and attractive, comfortable to be in. Popular, too: There always seemed to be folks at the door waiting to get in. An aside: The short menu, the happy bistro ambience created by the one-large-space, and the dominating bar are attributes Me & Julio shares with the Reef. From the outside at least, Timbre looks to be similar. Waazubee was one of the forerunners of this style on the Drive, but their space is too dark and internal to work as well. Charlatans would like to be seen that way, I believe, but the multiple levels takes it out of the one-large-space category. With at least three new restaurants opening with this style, perhaps this is the new Drive look and feel. I don’t mind it at all. 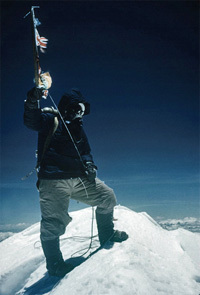 Today is the 55th anniversary of the first successful climbing of Mount Everest by Tenzing Norgay and Edmund Hillary. News of the success arrived in England the day of Queen Elizabeth’s coronation and I remember my father, who was very excited by the news, telling me all about it. For years thereafter Edmund Hillary was the greatest hero of my young imagination. I have one or two memories about my brother and me that pre-date May 1953, but Hillary on Everest is the earliest I can recall anything outside the family. I know from photographs that there were massive street parties I attended to celebrate the new Queen: I remember none of that. But Hillary on Everest has stuck with me all these years. The picture is of Tensing Norgay taken by Hillary. There are no pictures of Hillary on the summit because Tensing didn’t know how to work the camera and, as Hillary said, the summit of Everest was no place to start teaching him! My biggest painting to date. The texture doesn’t show well in the photograph but at least the colours are about right (I have been refusing to post earlier paintings because I could not capture them properly on camera). 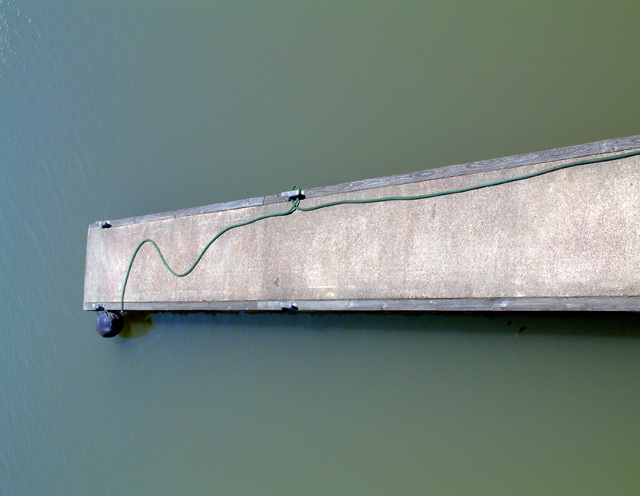 I enjoyed painting at this scale. Vancouver magazine’s May edition contains the “19th Annual Restaurant Awards” — the best in Vancouver eateries for 2008. It is the only edition of the magazine I ever buy. There are 179 winners and, as usual, only about three of them are east of Cambie. I was triggered to write this because we went to the Pink Pearl this morning. We were privileged to enjoy the freshest dim sum either of us could ever remember. The tastes were subtle, different, clean and delicious. The Pearl is always wonderful, but this morning was beyond that. And the Pearl was not even acknowledged in the awards. Three restaurants on the Drive were mentioned. Rinconcito Salvadoreno received the Silver award in the Best of the Americas category, while Lombardo’s garnered an Honorable Mention for Casual Italian. 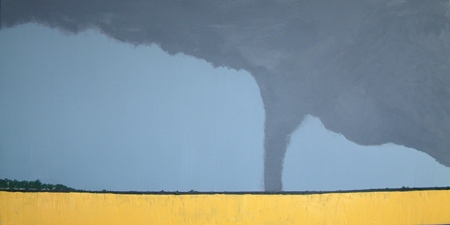 Me & Julio’s also received an Honourable Mention in the Americas category, which is odd — it can hardly have been open when the voting took place for this edition. But good luck to it! So, to finish the sumo thread for this month, the Bulgarian Kotooshu has become the first ever European to win an Emperor’s Cup. On the 14th day he threw down Ama and became uncatchable. Last night, the 15th day of the basho, he won again to finish at 14 wins and one loss. Kotooshu’s father was in the arena for the last two nights, flying a small Bulgarian flag and shaking the hands of everyone close — “That’s my boy!” Kotooshu, of course, beamed with his signature smile as he hugged the huge trophy. I was most interested in how the sumo crowd would react and I was pleased to see their cheering acceptance of his victory — you could almost hear them whispering, “At least he isn’t another Mongolian!” Kotooshu is the seventh foreigner to win the Cup, the others being Mongolians, a Samoan and a couple of Hawai’ian Americans. 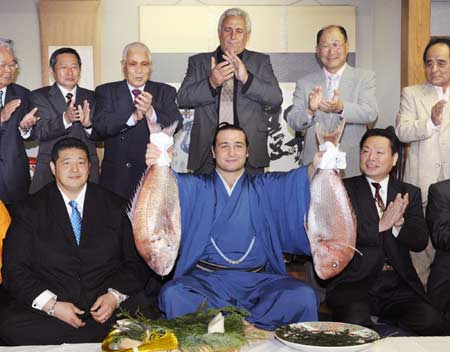 The accompanying picture shows Kotooshu surrounded by his supporters, and holding up the traditional sea bream prizes. His father is immediately behind him and his stablemaster is sitting to his right. By the way, my man Asashoryu beat up on Hakuho in the final grudge match of last night. He then gave Hakuho a small extra shove, which the younger man didn’t care for and there was a most un-sumolike confrontation in the middle of the ring between the two yokozuna. You are currently browsing the Jak's View of Vancouver v.3 blog archives for May, 2008.